When I want to check out a piece of software, one of the first things I look for (after the price tag) is the support matrix. 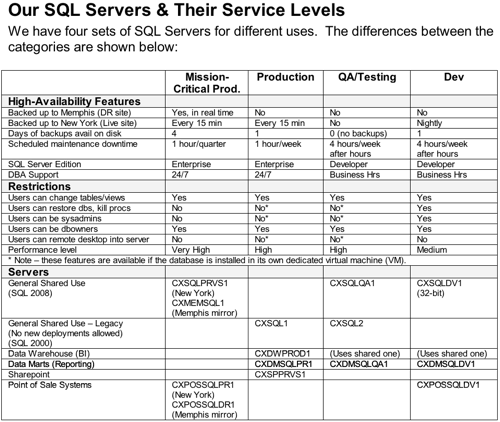 I want to know what versions of SQL Server and Windows they support. I lined that up with the available machines I had in-house, picked the right platform, and got started. Years ago, I noticed that when other users wanted to bring a new piece of software in-house, they brought me the product’s support matrix and asked what versions & servers we had in-house. Some departments (like the mainframe guys) got so many requests that they published their own standards document showing what they supported. When a manager insisted on putting certain kinds of software onto specific servers, the mainframe guys could point to their support matrix and say, “Sorry, that doesn’t match our standards. It needs to go on this other server over here.” Bam, discussion over. Wow – why wasn’t I doing that? Kapow, I laid down the law. For example, I would not be on call if the dev server crashed at 9pm when one lonely developer was working late – he could open a support ticket, and I’d address the issue in the morning. Note that this didn’t mean I wouldn’t fix the dev server after hours; I still set up SMS alerts to notify the team whenever ANY server was experiencing problems, and I wanted to get them fixed before the developers came in the next day. However, with this support matrix, I was setting up reasonable expectations across the staff so that we knew what was an emergency, and what wasn’t. If someone needed a database to be available 24/7, then that fell into the production category, not development. When I built this document, I didn’t show it to my existing customers. (Yes, I really think of my users and developers as my customers, not my coworkers.) The goal of the document wasn’t to change expectations for our existing databases, but to shape expectations for any new databases and applications that came on board. When a project manager wanted to bring in a nasty, poorly-written app that required SA permissions and 24/7 uptime, my support matrix backed me up. I simply said, “No, that’s not in our support matrix,” and handed them the document. If the manager has dealt with support matrixes before, they’ll recognize that these documents are usually built over time with a great deal of testing time and political wrangling. Your document wasn’t – but they don’t know that. They don’t know your document was only crafted with your finely honed intellect. They’ll assume the support matrix is not negotiable, because the vendor’s got a support matrix too, and it’s not negotiable either. The project manager will take the vendor’s support matrix, set it side by side with your support matrix, and look for a way to make this work. They want the path of least resistance. Your support matrix needs to give them an easy way to get their app in the house in the way YOU want to support it. In my support matrix, I noted that with asterisks – if someone really wanted to get remote desktop access or SA access to their server, they could have it – as long as we could install them in a dedicated VM. Presto – you’re not the bad guy, and you’ve got someone with much more power in your corner. Get started today by taking my sample SQL Server Support Matrix in our First Aid Kit and making it your own. If you liked this post, check out my Consulting Lines series here. Very nice post, Brent. You do like to do things the Chicago way! Thanks, sir! And yeah, I’m very much into the Chicago way, hahaha. I wasn’t born here, but I think my political mind was! Wow, this is really helpful. Great post as always Brent. Great post, helpful as always! Did I read this correctly that you allowed RDC into prod and QA/test if the boxes were standalone and on virtual servers, but not for dev? Interesting. Will – right, because dev servers were *always* shared. Nobody got a dedicated dev server, but they could get a dedicated prod or QA server. I get it now… Since the dev servers are a shared resource letting potentially many people have RDC access would degrade performance for everyone. Even in dev this is bad action. Thanks! When Brent logs in, he will be querying the table Brent.Customers. When any other user logs in, they’ll query the table dbo.Customers. The two tables will have different data, and that will quickly become a troubleshooting nightmare. I thought in SQL Server 2005/2008 it is no longer the case. Schemas must be different, but owner could be exactly the same. Pavel – nope, you can have different schemas and different owners. I am a bit confused. Did you mean “must” or “can”? This does not sound right to me. You can create table with the same name in different schemas. Schemas should not necessarily be owned by different people. “Multiple objects with the same name” means two tables named Customer. outstanding! can’t wait to drop the hammer on my first naughty vendor. Question, how do you set up your SMS alerts? An excellent post Brent, I am going to borrow your support matrix. And put it to good use. Thanks. Could you explain the reason why would you allow users to be members of the db_owner role in a critical production server or any production server? Ivan – because it’s usually what outside vendors require for their applications. It’s typical for a third party vendor app to require DBO, and I can’t say they can’t have it in production – that would immediately be a deal-breaker. You have to be realistic about what you’ll allow. Sure, I don’t want them to write cursors either – but that doesn’t mean I can ban all cursors from production. I don’t have that choice when we’re implementing third party apps. I’ve seen an app that requires it’s admin user to be a member of the sysadmin server role! You can guess what we did there…. But what about actual developer users – do they get accounts on the servers and db_owner rights on a critical server? Sam – I actually address this in the matrix download. Go ahead and read through that and it says who gets accounts where. It’s so much mo betta than I thought it would be – was just expecting the matrix. I noted the section on change control, which implies that developers shouldn’t be running change scripts in production. Hopefully I didn’t miss it, but what are your thoughts on read access in production? Write access?! I mention to our devs that in some places you don’t get ad-hoc query to the production databases and they think I’m delusional. I usually tell the Dev to google the first phrase, and imagine it combined with the second phrase. Thanks Brent. As always, your posts are informative and helpful. Great post, thanks. As soon as I saw the matrix, I immediately started building one. Question, even though it’s called a support matrix, but do you include those not under your responsibilities as well, just to make it clear that “Look, I am aware of this server, but see here, it’s not supported in my matrix”? Glad you liked it. No, I didn’t include any under my responsibilities. That’s a great question though – I can see why you’d have a separate list of excluded servers that you don’t manage. Brent, Great post. I have general environment but was not able to create such a nice visual representation. I will be borrowing your spreadsheet visual and incorporating it into our Policy and Procedures doc. Good post, but I want to bring up a topic on framing. (Medium is the message kind of stuff). As a recent hobby, I’ve been looking at how document layouts and other visuals influence what the audience/reader assumes. Making things look spiffy and polished can go a long way. If you deliver a support matrix as a well laid out pdf. It’s going to say a lot more than something scribbled on a napkin “I’m not gonna support devs on weekends”. It hints at “non-negotiable” without saying it. On the other hand, there’s a SQL website I know with a huge amount of technical authority that could probably use a visual overhaul, so what do I know. Thanks, sir! I’m honored by the comments about the style, but honestly, I’m back to the point where I hate the look of it again. (sigh) I seem to only stick with a visual look for about six months, and then I wanna tweak it. I’m working with branding & marketing consultants to come up with a new logo, tagline, etc. The reasons for that will become apparent in about a month when we (yes we) relaunch this site. Stay tuned! Seriously, the “we” sounds intriguing though. For me, it’s hard to spend too much time/$ on the look of my blog when my blog is not a big part of “what I do” (the drawings are just a fun hobby that meshes well with it). Just had some funny looks from colleagues as I read that last bad cop paragraph laughing out loud. Greg – hahaha, nice. Thanks, glad you liked it! Woot! There’s a Dilbert Cartoon in there! Thanks for another superb post. The problem is, I am not able to download the SQL-Server-Support-Matrix.doc document. When I click on it, it takes be back to this page. I was wondering if the document is still there or not? Mohammad – doh! Sorry about that, fixed. I follow all your on-line information, but I just found this little doosey…. Hey Brent, Very helpful doc. Just started my new job as DBA few months back and I am glad to run into your this post through one of your training documents. I have download the support matrix which is going to be very helpful to set the right expectation…Thanks again! Great, glad I could help. This is a great post and it has just painted some real life experience. It has been helpful Brent!!! 2006-03-28	Bill Gates	Redesigned to use the new getOrderHistory function. Always the best source of information for anything SQL Server. Thanks for the wonderful article. Is this matrix still available? Yep! Just click on the link in the post.